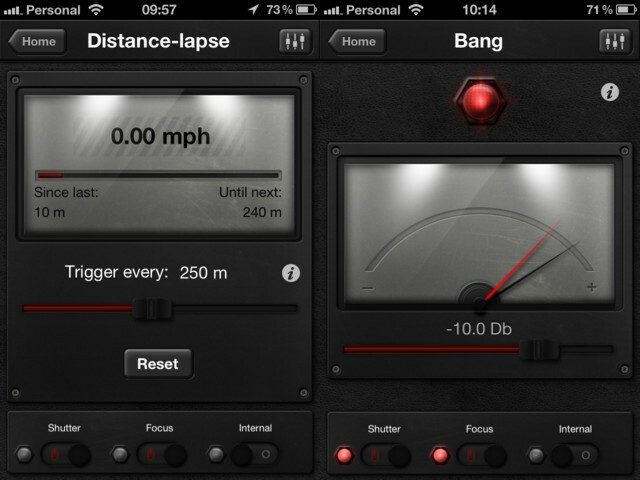 TriggerTrap is another app which works with an accessory cable to remote trigger you DSLR. Compared to other trigger app/cable combos, TriggerTrap distinguishes itself by also triggering the iPhone’s own camera, should you wish, and by its crazy range of triggering modes. A couple of those deserve some explanation: Eased Timelapse is like regular time-lapse, only you can ease in and out, starting slow and then speeding up, and then slowing down to a stop. HDR mode uses the camera’s bulb setting to control the shutter speed. You set everything else to manual, and the trigger will vary the length of the shutter opening to give different exposures, ready to be combined in HDR software and turned into some hideous bright and garish image. Many cameras have this built in, but this will be handy if not. Another neat trick is Distance-Lapse. This uses the iPhone’s GPS to trigger the shutter at certain distance intervals. If you’re walking, set it for every 20 meters or so. If you’re driving, you should set the distance a little longer. The features go on and on, and to get a taste you can grab the free version and test it out. The full version costs $10, which actually seems really cheap for the amount of functionality packed in there. A cable to connect it to your camera will cost another $10, plus a dongle twixt camera and cable for another $10. This might seem silly, but if you have more than one camera then it will actually work out cheaper than standalone $0 cables. Available now.